Looking for somewhere to beat the heat? Drink and dine in style at one of London’s hottest new terraces. 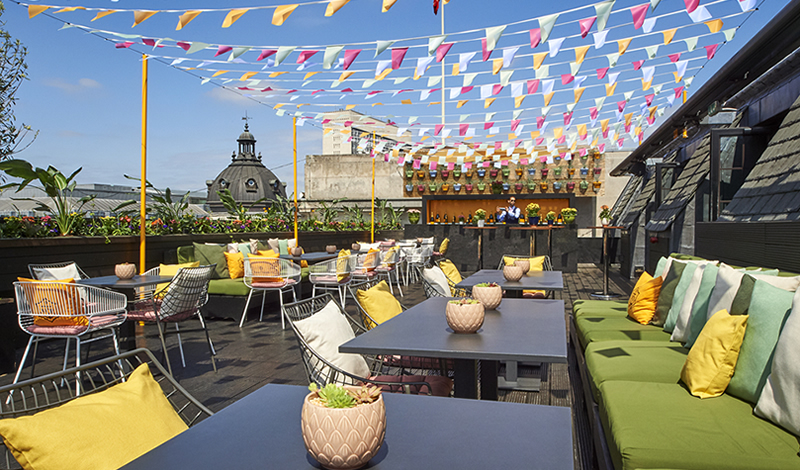 London’s skyline just got a lot more colourful, as Aqua Nueva has given their rooftop terrace a summer makeover in collaboration with Veuve Cliquot. Adorned with exotic flowers and papel picado (Spanish festival flags), it’s the perfect setting to toast a beautiful summer’s day. There are five colour inspired cocktails to enjoy, including ‘Once Upon a Time Back Home’ – a potent mix of red pepper infused vermouth, Galliano L’Autentico, and lemon juice, topped with Veuve Clicquot. After a few drinks, head inside to enjoy modern Spanish dishes like black seafood and aioli croquetas, fennel cured salmon, and Iberian pork fillet with pineapple and lime salsa. 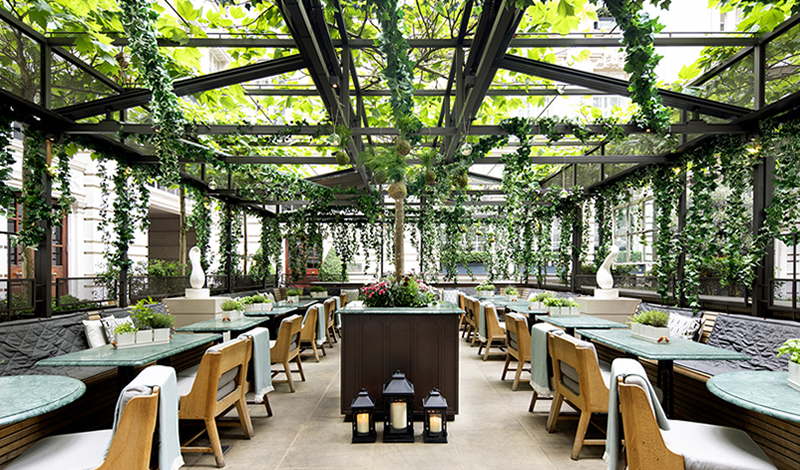 The five-star Rosewood London has teamed up with The Botanist gin to create a beautiful summer greenhouse in the middle of the hotel’s courtyard. Escape the bustle of the city and enjoy a drink or two under a canopy of foliage and hanging terrariums. The cocktails have been designed to complement the complex flavours of The Botanist gin, which is distilled on the Scottish island of Islay, and guests will be able to choose their own garnish from a selection of fresh herbs and botanicals. We love the sound of ‘The Odyssey’ – a sharing cocktail made with gin infused with cardamom, lime, Italicus and rooibos tea. On the food front, there are Scotch eggs, shrimp burgers, chicken pie and more – all supplied by the Holborn Dining Room. City seafood restaurant Fish Market has launched a terrace dedicated to the most decadent of culinary pairings – Champagne and oysters. With a little help from Wright Brothers and Moët & Chandon, they’re bringing a taste of the seaside to the city, as well as plenty of bubbles. 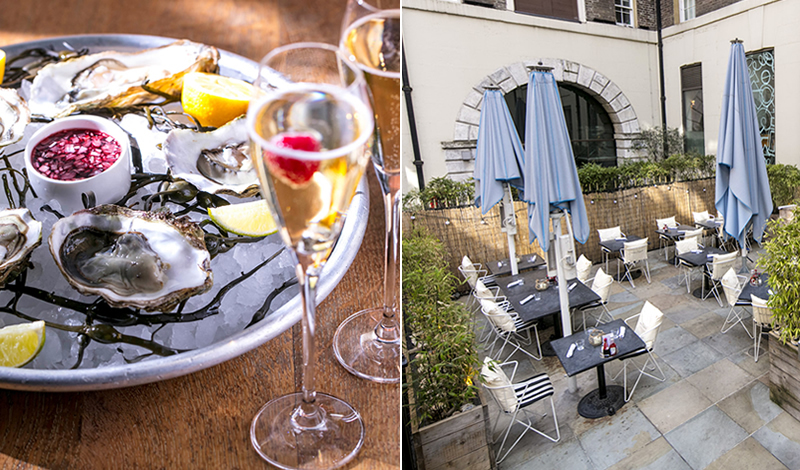 Throughout the summer, you can enjoy four oysters and a glass of Champagne starting from just £15. 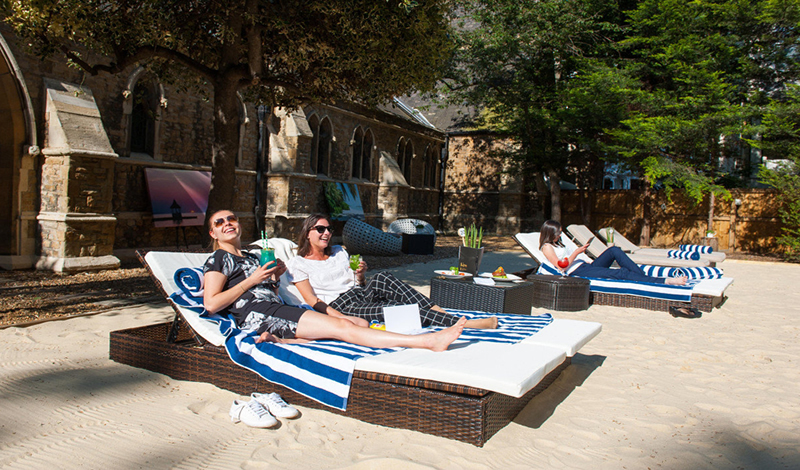 If you haven’t had time for a proper holiday yet, head to Kensington to discover a secret beach club complete with golden sand, sun loungers and cosy cabanas. You don’t even need to pack the essentials – there are beach boys on hand to offer towels, flip flops, and sun cream. Take a date and sip Mojitos in the sunshine or get your squad together to share one of their enormous fishbowl cocktails. There are fresh salads, pizzas, and sharing platters for when you get peckish. Kick back and relax in The Sipping Room’s Tanqueray Garden, a waterside terrace complete with a rosé Negroni fountain and a pick-your-own herb wall for creating the perfect G&T. There are five garden cocktails to choose from, including the Rosy Negroni and the Sevilla Spritz – both are made with Tanqueray’s new Flor de Sevilla orange gin. Staying for dinner? Try The Sipping Room’s excellent burgers or graze on sharing dishes like prawn lollipops and crab bruschetta. 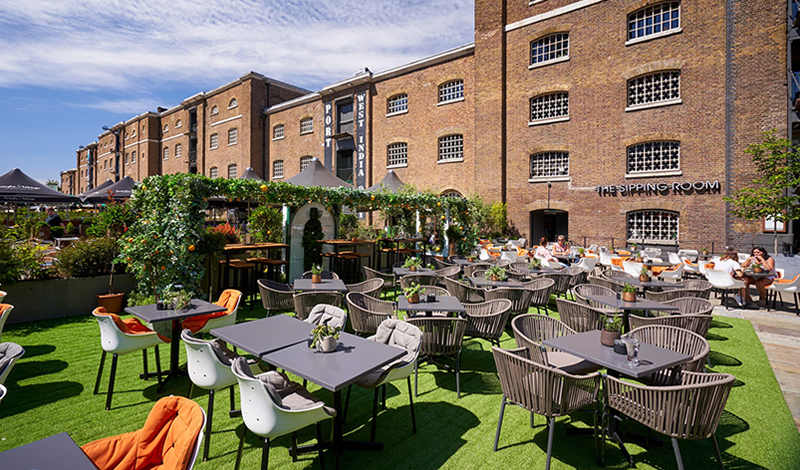 Visit OpenTable to discover more alfresco dining destinations in London.